January 1, 2002 Jupiter was overhead at midnight on New Year's Eve, joined in the sky by a nearly full moon. 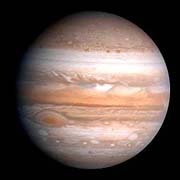 Jupiter's position is directly opposite the Sun as seen from Earth. 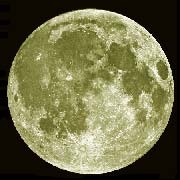 That's why it was so brightly lit, especially in the Northern Hemisphere. While Jupiter appears opposite the Sun every 13 months, the last time of the Jupiter-Sun opposition at midnight on New Year's Eve was in 1752, and the next time will be in 2084. Let's look back 250 years and see what happened the last time when Jupiter shined so brightly on New Year's Eve in 1752. Many events happened in Philadelphia, 24 years before the Declaration of Independence. Navigation Note: Bookmark this page. Links on this page will lead you to an outside website. Born January 1, 1752: Betsy Ross (Elizabeth Griscom), seamstress from Philadelphia. Legendary folklore says she sewed the first American flag (June 1776). She died on January 30, 1836 at the age of 84. 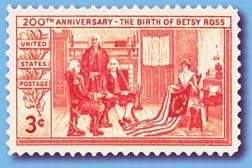 The U. S. postage stamp was issued in 1952 to commemorative the 200th anniversary of the birth of Betsy Ross. 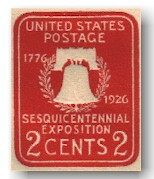 The stamp shows Charles H. Weisgerber's 1893 painting The Birth of Our Nation's Flag. Betsy Ross is shown at her Philadelphia home presenting the first U.S. flag to George Washington (left), George Ross (standing), and Robert Morris in June 1776. Washington had drawn a sketch of the flag with 6-pointed stars. Betsy Ross convinced the committee that she could make 5-pointed stars easily in one snip of her scissors. Born July 7, 1752: Joseph-Marie Jacquard (1752-1834), was born in Lyons, France, the son of a weaver and pattern maker. As a 10-year old he was brought into the weaving business by his parents. The repetitive task of of controlling the warp and weft threads on a silk loom to create patterned textiles inspired him to invent a more efficient machine. 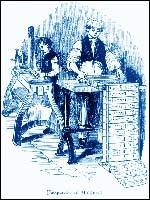 In 1801, Jacquard invented the first automatic loom using punched cards for the control of the patterns in the fabrics. Needles fell through holes in the cards and lifted the warp strings. Various combinations of punched holes created different designs and patterns in the woven material. The Jacquard loom revolutionized productivity and quality of textile weaving. However weavers saw the innovation as loss of their jobs. They rioted, burned the looms, and attacked Jacquard. In 1806, Napoleon, recognizing the value of Jacquard's loom, gave him a lifetime pension and royalties. This allowed others to manufacture Jacquard's looms which quickly spread across Europe. Variations on Jacquard's punched cards were used to represent music played by automated pianos and the storing of programs for computers. Jacquard died on August 7, 1834 at age of 82.
. 1752 Lightning Rod: On June 15, 1752, Benjamin Franklin (1706-1790) discovers the electrical nature of lightning by flying a kite in a thunderstorm. The kite has a wire conductor, a key at the end of its wet twine kite string, and a silk insulator which Franklin keeps dry by standing in a doorway. He sends his friends in London a paper entitled "Experiments and Observations in Electricity Made at Philadelphia." 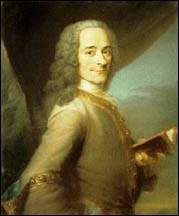 In September 1752, he equips his house with a lightning rod, connecting it to bells that ring when the rod is electrified. The lightning rod when placed at the apex of a barn, church steeple, or a house, conducts lightning harmlessly into the ground and prevents fire in electrical storms. In 1752, Franklin also founded the first American fire insurance company. The 1956 postage stamp honors the 250th anniversary of Franklin's birth. It shows an elder Franklin assisted by allegory of youth in his famous kite experiment. September 1752 Had Only 19 Days September 3, 1752: The Gregorian calendar (New Style or N.S) replaced the Julian calendar (Old Style or O.S.) in England and its American colonies, by an act of Parliament. The difference between the Julian Calendar of 46 B.C. and the Gregorian calendar has grown to 11 days. Parliament decreed that Wednesday, September 2 will be followed by Thursday, September 14. The Gregorian Calendar was adopted by Pope Gregory XIII in 1582 in most European countries. As this change comes to England, bill collectors became confused. Rumors spread that employees are losing 11 days' pay, and everybody is losing 11 days of his life. Londoners cried, "Give us our 11 days back!" and people rioted in the streets to protest the calendar change. Benjamin Franklin wrote "It is pleasant for an old man to be able to go to bed on September 2, and not have to get up until September 14." 1752 Liberty Bell: Cast in London's Whitechapel Foundry for the Pennsylvania Statehouse, the Liberty Bell arrived in Philadelphia on September 1, 1752. It was cracked during test ringing, was melted down, and re-casted twice by Pass & Snow in Philadelphia in 1753. It is inscribed with the words, "Proclaim liberty throughout all the land unto all the inhabitants thereof" (Leviticus XXV:10). The bell was rung on July 8, 1776, for the first public reading of the Declaration of Independence. Hidden in Allentown during the British occupation of Philadelphia, it was re-placed in Independence Hall in 1778. The bell cracked on July 8, 1835, while tolling the death of Chief Justice John Marshall. In 1976 the Liberty Bell was moved to Liberty Bell Pavilion on Market Street between 5th & 6th, Philadelphia, near Independence Hall. The Bell weighed 2080 lbs originally and 2055 lbs today. The circumference around the bell's lip is 12 feet and 7'6" around the crown. The height from lip to crown is 3 feet. The Bell tone is E-flat. In 1996, an April Fool's hoax in newspapers stated that "Taco Bell buys the Liberty Bell." ideas which are perceived." 1752 "Westward the Course of Empire Takes Its Way": This poem from On the Prospect of Planting Arts & Learning in America was written by the Irish philosopher George Berkeley (1685-1753). The first printing of the revised version was published in Dublin, A Miscellany, containing Several Tracts on Various Subjects (1752). Berkeley's poem became a motto for Manifest Destiny in America after 1850, and was portrayed in Emanuel Leutze's painting (1861) of "Westward." Berkeley's philosophy postulates that matter doesn't exist apart from perception, that everything arises from consciousness. Samuel Johnson (1709-1784), who compiled the first major English Dictionary (1755) tried to disprove Berkeley's immaterialism by kicking a rock, "I refute it thus!" However, Berkeley's idealism harkens back to Buddhism and Vedanta that all is Mind. It also anticipates modern physics that atoms are not solid but empty waves of electronic energy. On May 24, 1866, Trustees of The College of California unanimously adopt the name Berkeley, in honor of George Berkeley. An American clergyman & philosopher, Samuel Johnson (1696-1772) met Berkeley in Newport, Rhode Island, and they became friends. He later became the first president of Columbia University (1754), and wrote the first philosophical text in America, Elementa Philosophica, published by Benjamin Franklin in 1752, and was dedicated to Berkeley. Complete poem. John Nash (1830) Born January 18, 1752: John Nash (1752-1835), architect, town-planner, landscape designer, bridge-builder, engineer and entrepreneur. Nash was born in London, the son of a millwright, but he cast aside his father's profession and apprenticed with architect Sir Robert Taylor. After inheriting a large sum of money, he retired to Wales and lost his fortune on some bad investments. In 1792, Nash was forced to take up architecture again. He found a great patron in George IV (then Prince of Wales) and was commissioned to design Regent's Park. George IV also arranged for Nash to create Buckingham Palace out of Buckingham House and the rebuilding of the Royal Pavilion at Brighton (1826) with an Oriental theme. Other works of Nash include Haymarket Theatre (1820), All Soul's Church in Langham Place (1824), The Royal Mews (1825), Cumberland Terrace (1827), Carlton House Terrace (1827-1833), Marble Arch (1828), and St. James's Park. Nash also created what is now Trafalgar Square. However the surrounding buildings were all created by later architects. John Nash died in 1835 at the age of 83. The pen and ink Nash portrait is by Sir Edwin Henry Landseer (1802-1873) at the National Portrait Gallery in London. A web site on Nash's architecture notes that: "He worked in many architectural styles, from Gothic to Italianate, Palladian, Greek, and picturesque. He was enthusiastic and impatient, yet a man blessed with great talent and creative vision." Michael Mansbridge's book John Nash: A Complete Catalogue (1991) is a fully illustrated survey of Nash's works. Click above link for 17 sample pages of book. by Sir Joshua Reynolds 1752 Female Quixote or The Adventures of Arabella Published: This satire parodying Cervantes' style is the best work of Charlotte Lennox (1720-1804). She was born in New York, daughter of a British Colonel, James Ramsey, who was a governor of the colony. She grew up in Albany, NY, until age 15 when she was sent to live with an aunt in England, whom she found to be insane. Her father died soon after, and she tried to earn an living as an actress. When this failed, she turned to writing and was befriended by Samuel Johnson, Samuel Richardson, and Henry Fielding. In 1747, she married Alexander Lennox, and also published her Poems on Several Occasions. 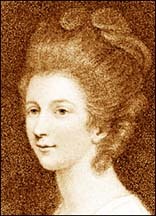 Her sentimental novels Life of Harriet Stuart (1750), Female Quixote (1752), and History of Henrietta (1758) were popular with women in her days. She also published an historical account of Shakespeare's source material in Shakespeare Illustrated (1754). Lennox died in London on January 4, 1804 at the age of 84. A summary of The Female Quixote tells of Arabella spending her time reading romances at her father's secluded castle. She began believing the romances to be true and models her life after them. Arabella's obsessions lead her through many adventures. After diving into a river, she falls ill, and a doctor comes to treat her. Using cold logic, he dissolves Arabella's misconceptions. Amazon.com has 14 sample pages from The Female Quixote.